Corpus Christi, Texas has won several awards as a city. It was selected as an all-American City in 2003 and routinely surfaces as a best place to live. Located near the southern tip of Texas, it has a warm climate and an extensive waterfront. Its popular beaches are just one reason why people move here. Corpus Christi, with a population of almost 280,000, is large, but not so big that it is overwhelming. The city bills itself as "The Sparkling City by the Sea,” or simply “Corpus”. The name derives from the Spanish, “body of Christ”, a reference to the Eucharist. There are many local attractions, particularly concerning the waterfront, boating, beaches, and fishing. Golf is popular here. The downtown area has a museum district, skyscrapers, lots of interesting shops, plus marinas along the interesting waterfront. A number of older restored houses can be found Heritage Park. Active adults in retirement will find every kind of housing choice – from dedicated retirement communities to all types of housing in the city’s neighborhoods. From apartments to condos to houses, the area offers very good value and is a reason why Corpus Christi is one of the fastest growing metros in the U.S. Prices are among the most stable in the country. The price of a home here is considerably less than the national average. The National Association of Realtors reported that the media selling price of a home in Corpus Christi in the last quarter of 2018 was $194,500. 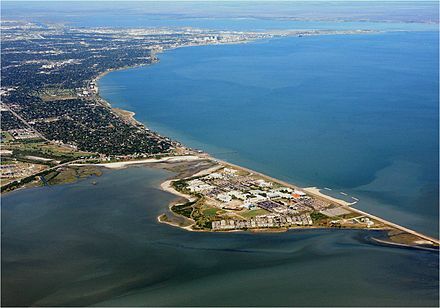 Corpus Christi is located on a bay in what is usually called South Texas. It is somewhat protected from major storms by 30 mile long barrier island, Mustang Island. Corpus Christi has a warm semiarid climate, reaching average highs in summer months in the mid 90's. The average low in January is 46 degrees. The Corpus Christi has very high average wind speeds, making it ideal for wind-related activities. The crime rate in Corpus Christi is above the U.S. average. As is befitting a progressive city there are many large hospitals here, including the Corpus Christi Medical Center. The Corpus Christi International Airport is on the west side of the city.